Repost from the original here. I’m writing this post with, you, our customer community in mind … those of you, entrepreneurs, who may be feeling the doom and gloom of recent external events or simply dealing with the ongoing struggles of running a business and living life. The fact is if you’re in business for any length of time, you’ll undoubtedly experience your share of fear and uncertainty. I know I have. If I reflect back on the last 8+ years of full-time entrepreneurship at iThemes, I can come up with a never-ending list of times I felt and was consumed by fear and uncertainty. This year is no different for me. In fact, at times during the last six months in particular, I’ve felt a swell of fear and uncertainty creep into my thoughts. You just have to open up a news site or turn on the TV to see doom and gloom almost everywhere, whether it’s violence and terrorism, a struggling or stalled economy, a nasty election year (here in the U.S. in particular) and internationally things like Brexit, wars, attempted coups and a hundred more sad headlines. Taken as a whole, it is simply depressing. And I’ll admit I’ve been overly focused on many of these events this year which has produced uncertainty in me. Add those things to an already incredibly difficult job — that of entrepreneur — and it can get overwhelming. It seems to be part of the gig, sometimes a weekly event, but it doesn’t have to poison, rule or deflate you. And so I’ve been working hard to combat those feelings and turn the energy from them into something positive and productive, focused on the certainty of the things I can control. This year has felt uncertain and I want to help change that — For the reasons mentioned above this year seems especially filled with deep emotions, from fear, uncertainty, anger and doom and gloom. I want to make a positive impact in the other direction. This topic has personally affected me and I know it has others. Help empower you to move forward and be bolder — I see this subject as something affecting the majority of our customers. I want to help you refocus on the positive, the productive, and on hope and boldness. Your success is our success. If you win, we win. And I want you to win. Make people’s lives awesome x 30,000 — If we flip the script on this, it’ll have a huge impact on us, you, and those you serve with a powerful multiplying effect. I needed this — Frankly, I needed a reminder on battling fear and uncertainty. Writing helps, and helping others helps me. So let’s start unwinding fear and uncertainty, get to the roots of it, and figure out how to fight it. 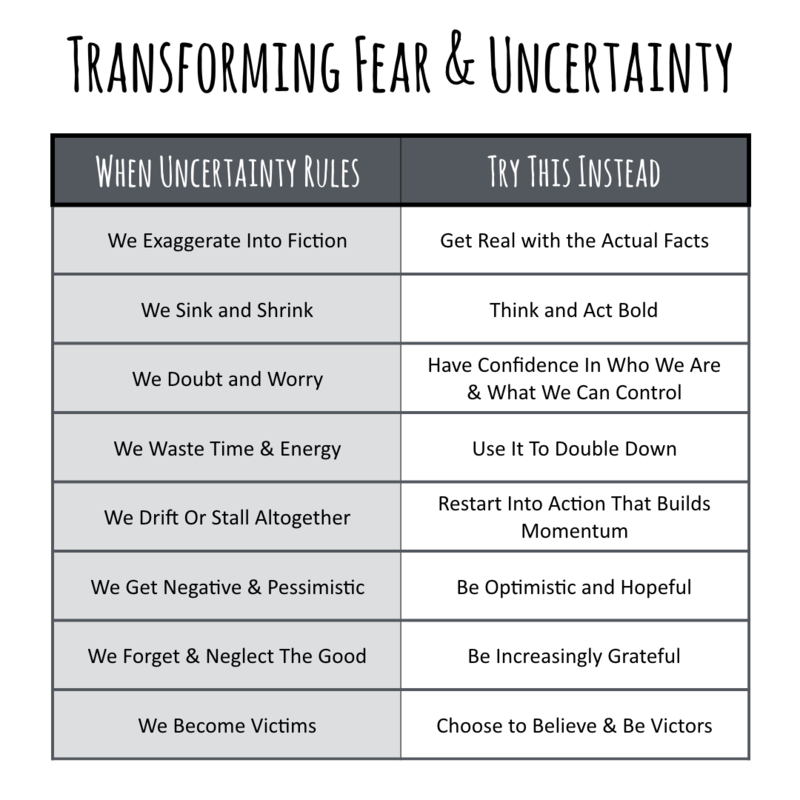 I used my own thoughts and feelings over the last six months or so to get to the core of fear and uncertainty. We exaggerate into fiction — taking one event and rewriting our entire story to be a tragedy. We sink and shrink — letting other forces or events make us and what we’re doing feel small and insignificant. We doubt and worry — about events completely out of our control, which then makes us question our plans, ideas, work and future. We waste precious time and energy — using them on distractions, like other events and people and other people’s plans and work and events. We drift or stall altogether — losing momentum for what we’re doing and building and offering the world. We get pessimistic and negative — positioning a dark cloud over all we do and are. We forget and neglect the good — the people, work and success we already have received. We become victims — allowing these events to decide our fate, our story and who we will be. Too often this is the tragic reality for many of us. But to put it simply and directly: We need to flip that script. We need to transform uncertainty into certainty, the negative into positive action, waste into productive energy to what we’re doing and what’s working and focus on who is it all for. Instead, we need to choose ourselves, our story, our plans, our work, our clients and customers. [pullquote]Too often we exaggerate and distort the truth so much it turns into fiction. [/pullquote] We take epic action-adventure stories and turn them into dramas and tragedies with bad endings in our minds. We let one negative or bad event turn into the entire theme of our lives and businesses. One of the best ways I’ve worked through these is private journaling. When the biggest fears and uncertainty sets in, I open up my private journal and start expressing what I’m feeling and thinking. It helps me sort fact from fiction, exaggeration into exacting, the really real from the morbid nightmare. What are the actual facts of what’s going on and causing the fear and uncertainty in you? Detail how it effects you. Write it out. Ask yourself why and how at every detail to go deep. Vomit out those feelings on paper or keyboard privately …. all the poison and get to truth and reality. Now, after getting it all out … what are the actual facts you’ve discovered? Are your fears and uncertainties real or perceived? Exaggerated or narrow? Is it as bad as you first thought? For me, it usually it looks like a pebble instead of a boulder. No one benefits from me shrinking and sinking in the face of uncertainty. Shrinking and sinking cascades and permeates everything and everyone around you. But the good news is … so does boldness. Your customers and clients and team see your boldness, especially in the light of uncertainty. Deep down, all of us want to hear the words — “Everything is going to be OK” — especially in the midst of uncertainty. I know I do. It gives others confidence and boldness so they can focus on the positive and productive. And respond boldly … show it to your people (clients, customers, team) and return with that confidence to your plans and your work. Commit to be and act boldly in the face of fear and uncertainty. It’s a better way. When faced with fear and uncertainty, we too often start to doubt ourselves and our work … and then heap a ton of needless worry on top of it. Worry and doubt, left unattended, get put on repeat and you get stuck in an infinite loop that leads to despair. So when I feel myself getting consumed by doubt and worry, I often go back to what I’m confident in and about … and typically that’s myself (and my team) and what we’re doing for others. I refocus on my unique talents and strengths (aka what I offer the world). I remind myself I was made for a purpose, gifted with tools to make other people’s lives awesome. And I simmer my thoughts in that mission and purpose. Then I ask: In the face of this fear and uncertainty, what can I actually control? And the answer is always: My actions and reactions, thoughts and feelings. How can you act and react more productively and positively? What thoughts are you focusing on? What are the stories you’re telling yourself and how can you make them richer and better? And, finally, what emotions are coming from those new thoughts? I hope it’s confidence, boldness and hope in what you’re doing for the world. Worry and doubt and fear waste so much precious time and energy. They kill dreams before you ever get started. But they do produce a ton of available energy. I’m an energy miser … I save every bit of energy I can and then seek to use it only on the positive and productive. So often that means asking: What’s working? And how can I do more of it today? What are the critical actions you can take now with this energy that could make all the difference for you? Where would it be put to better use? I love this quote. It excites me, especially in the face of uncertainty because I feel more in control. Being consumed in uncertainty destroys any momentum you’ve made previously toward that future you were seeking to create. We drift off to the shoulder and in essence put our progress and plans in neutral. Instead … we should ACT. So what action can you take today that creates your future? What simple acts can you make today to make progress toward that? Instead of sitting still, what is one step you can take now? Find and do something, anything that creates and keeps the momentum going for you, something positive and productive that gets you closer to where you want to go. In his excellent book “Hard Optimism,” Price Pritchett shares the differences in how pessimists and optimists view good and bad events. Pessimists view Good Events as: Temporary, Externally Caused and Specific and Limited. Pessimists view Bad Events as: Permanent, Internally Caused and Pervasive and Widespread. But if we want to switch the negative to positive, we need to flip the script to that of the Optimists. Optimists view Good Events as: Permanent, Internally Caused, and Pervasive and Widespread. Optimists view Bad Events as: Temporary, Externally Caused, and Specific and Limited. Seeing the reversal was especially helpful for me to begin changing my mindset and attitude about all events. By the way, he gives the five “enemies of optimism” as: concern, complaining, commiserating, criticizing and catastrophizing. All things we do in the midst of fear and uncertainty. Flipping the script helped me recently. I kept bemoaning that the year feels down. I even found some articles about how election years produce all kinds of uncertainty that trickle down through the economy. And I wallowed in the doom and gloom. Then one morning recently I woke up and realized something … I started iThemes in 2008. It was an election year. And if you recall, the time period of the financial crisis. Many of the events and stories are so similar — 2008 and 2016. Yet we powered forward. Our business grew. We made money. We hired four people by the end of that year …. despite the world feeling like it was crashing down around us. I tell people at the beginning I was luckily so naive, none of it really mattered much to me. Yet we got through it. It was an awesome reminder for this year. And I started thinking about the future. I got excited. I know it we made it through 2008, we can surely do so in 2016 and beyond. These things happening in the world … they are Temporary, Externally Caused, and Specific and Limited. And the good things happening (and they are) are Permanent, Internally Caused, and Pervasive and Widespread. Instead, we focus solely on the bad, instead of taking into account all the great things that has happened to us, or caused by our actions. Thankfulness is one of the most powerful antidotes for turning my moods, my thoughts around. In fact, it’s like throwing a bucket of ice water on my emotions. It sobers me up to the reality of our situation, and the hope we can find in our situation. Shawn Achor, author of the excellent book “The Happiness Advantages,” suggests writing down three things you’re grateful for each day. I’ve done it many times. And it awakens me to all I already have and am intensely greatly for. If I’m stuck, consumed and drowning in fear or uncertainty, I’ll often take this exercise back to my private journal and start writing about all I’m thankful for, even the seemingly minutiae. I’ve done this numerous times in the last couple of years and my mood, my outlook, my energy, my confidence, my hope have all greatly benefited from it. No one willingly wants to be a victim, especially in fear and uncertainty, but we find ourselves as such when we let ourselves be consumed by it. But I don’t want to be a casual observer of my life as someone else writes it. I don’t want a passive life that other events or people dictate to me. So I choose the opposite … to be a victor. I seek to be active and engaged in my life and I want to feel the victory from what I do instead of succumbing to what happens to or around me. Ask yourself: Will you be passive or active, a victim or a victor, today? Will I be an active creator of the story of my life, or succumb to another darker version of it? Being the victor is such a better story.